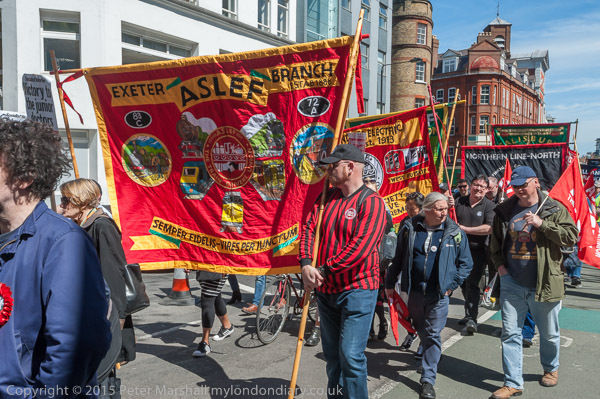 One of quite a few things that I’ve long held against the Labour Party (despite voting for them in many elections) is their failure when in power to make May Day a public holiday. Instead we have an ‘Early May bank holiday’, which in 2017 will happen to be on May 1st. In 2016 it was on a Sunday, so at least most workers could celebrate it, though the great majority probably followed their usual Sunday routines, more likely to involve collapsing on a sofa with the Sunday papers than going on a political march. The May Day tradition as International Workers’ Day, according to Wikipedia dates from a Second International resolution of 1891 and was strengthened in 1904 by a resolution calling for energetic demonstrations for the eight hour day, class demands and universal peace, with workers stopping work wherever it was possible without injury to them. Unfortunately when I was still in full-time paid employment, work continued except on those days when May Day fell at a weekend. According to the organisers of the London march, it has been celebrated in London since the 1880s. 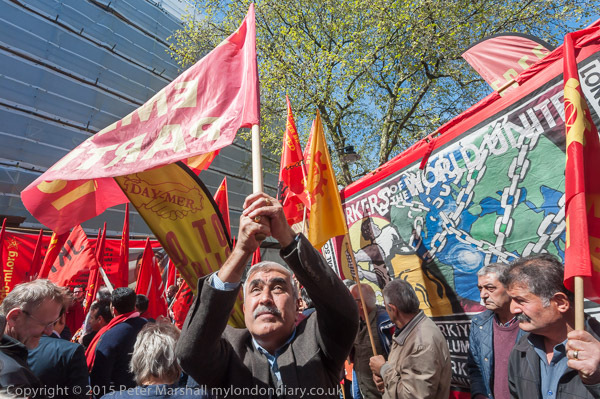 May Day in London, though supported by the trade unions, has been largely kept alive by organisations of immigrant workers, particularly from London’s Turkish and Kurdish communities along more recently with the more sporadic activities of various anti-capitalist groups. If I could be bothered I would try to correct the Wikipedia article which states “May Day activities (from 1978) are on the first Monday of the month.” In general nothing much happens then – and the May Day events in London that it mentions took place on 1 May 2000 – which happened to be a Monday so was also a bank holiday, and I was there when the windows were smashed at McDonald’s, leaving as I saw the riot police rushing in. Now I would stay to take more pictures, but then for various reasons I was less willing to take risks and left as I saw the glass being broken and riot police rushing in. GLATUC, S&ERTUC, UNITE London & Eastern Region, CWU London Region, PCS London & South East Region, ASLEF, RMT, MU London, FBU London & Southern Regions, GMB London & Southern Regions, UNISON Greater London Region, Globalise Resistance, Pensioners organisations and organisations representing Turkish, Kurdish, Chilean, Colombian, Peruvian, West Indian, Sri Lankan, Cypriot, Tamil, Iraqi, Iranian, Irish and Nigerian migrant workers & communities, plus many other trade union & community organisations. 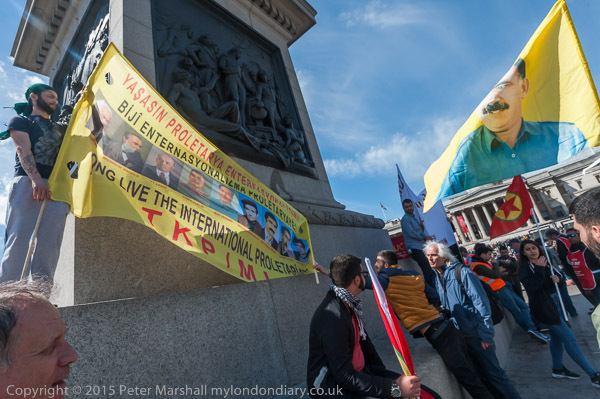 The arrival of the march in Trafalgar Square led to a fight between stewards, photographers and the more militant marchers to try and keep the plinth around Nelson’s column clear. 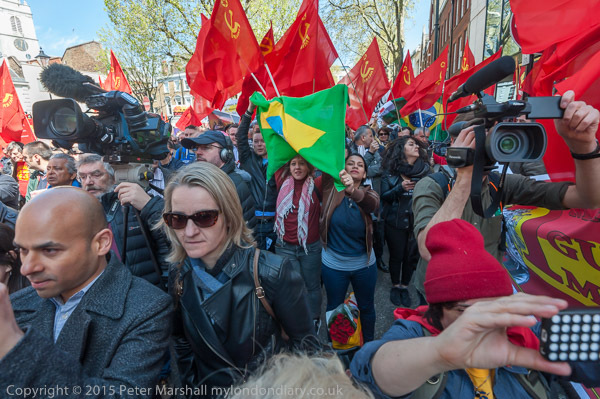 I wasn’t happy about being told I couldn’t photograph from there and by the total lack of fraternal solidarity shown by the stewards to their fellow trade unionists trying to do their job. 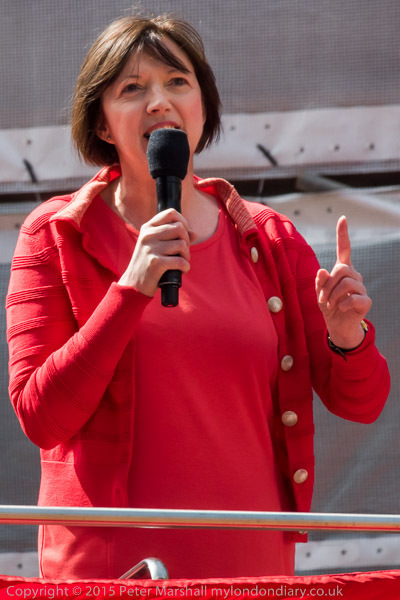 The march is followed by a rally in Trafalgar Square, which those various trade union organisations seem determined to keep as dull as possible. Most of the community groups soon drift away, and are followed by most trade unionists who are feeling thirsty after the march. 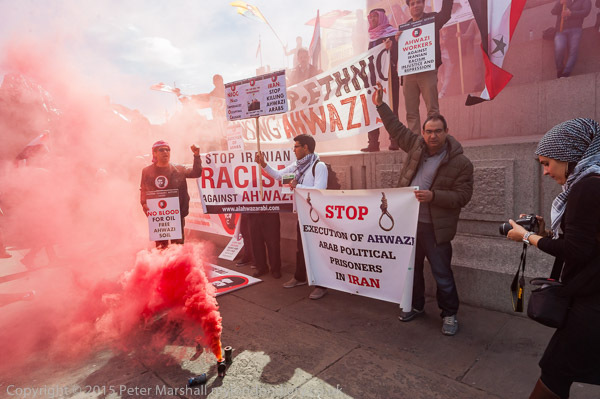 Fortunately the start of the event was enlivened a little by members of various communities taking little notice of the stewards, and in particular by the arrival of Ahwazi protesters who set off a number of smoke flares, as had some of the Turkish protesters when they entered the square. This entry was posted on Saturday, January 28th, 2017 at 10:46 am and is filed under My Own Work, Political Issues. You can follow any responses to this entry through the RSS 2.0 feed. You can leave a response, or trackback from your own site.